Spring has sprung and we’re just as excited as you are for buzzing bees and clear blue skies. But the weather will warm up fast and what will start as a comfortable spring, a sweet reprieve from the ravages of winter, will soon turn to harrowing heat and gobs of sweat. Be prepared for when the Essex weather turns from the pleasant, clean-cut spring into a sweat fest by getting your HVAC and set and ready to go now. Check out our HVAC technician’s opinions on how to prepare your system for the season change. You don’t miss taking your car in for an oil change because you want it to last. Don’t skip calling the HVAC technicians in Essex to look over your HVAC now, rather than when it’s broken and the repair is more expensive. Preventative maintenance does much the same thing as an oil change on your car as it makes sure the machine is running smoothly and that the mechanical functions are less likely to break down unexpectedly. Just like when you went around the exterior of your home and looked for hot air leaks, you’ll need to have someone look for leaks in your duct work. This time, the process is a bit more complicated and we’d recommend calling in the professional HVAC technicians from Jay Mechanical to take a really good look at how your ducts area working, from seam-to-seam. This will ensure that the temperature-controlled air you’re paying for is actually getting through your duct system and into the rooms that you want. Rather than leaking out of your ducts wherever there’s a leak. Air filters are the best thing since sliced bread. They’re so convenient and make life so much better that we don’t even think about it; we just take their exceptional nature for granted. For this HVAC upgrade, you won’t even need an HVAC professional to facilitate it. 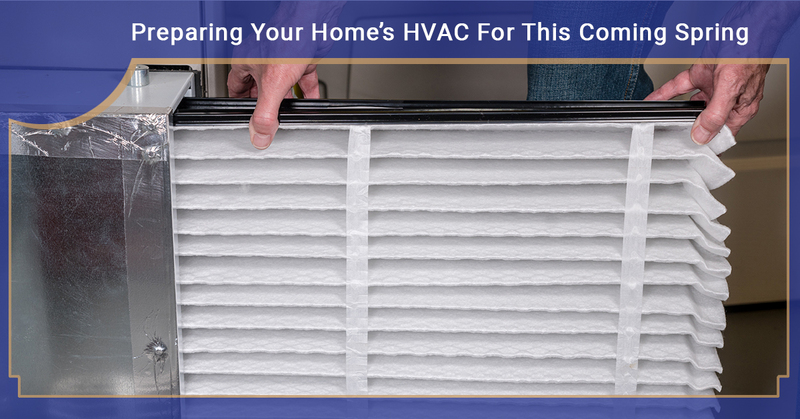 Check the label on the current one and go get a brand-new air filter to make your house smell fresh and clean for the spring air coming through your windows soon. There’s nothing more powerful than a programmable thermostat, when paired with a good AC. It allows better control of the temperature in your house because you can drop and raise your temperature according to when it gets cold at night and when you’re in need of a good blast of refreshing cold air to perk up the whole house. We know for a fact that it’s better to step into a home that’s freshly cooled off after a day at work, rather than one that is just as sweltering as your vehicle that’s been sitting in the hot Vermont sun all day. Get your spring HVAC unit updates from the best specialists now, with Jay Mechanical. We’re here to help you stay in control of the temperature in your Essex home, so reach out to us and schedule your seasonal maintenance today.